Suppose a 200-kg motorcycle has two wheels like, the one described in Example 10.15 and is heading toward a hill at a speed of 30.0 m/s. (a) How high can it coast up the hill, if you neglect friction? (b) How much energy is lost to friction if the motorcycle only gains an altitude of 35.0 m before coming to rest? This is College Physics Answers with Shaun Dychko This motorcycle is approaching a hill with some speed of 30 meters per second, that's a translational speed and our job is to figure out how high up the hill will it go. So it has some initial kinetic energy but the question is a bit more complicated now than we're used to from other chapters because there's also rotational kinetic energy to consider. So the total of the rotational kinetic energy and the translational kinetic energy will all equal the gravitational potential energy the motorcycle gains after it reaches its maximum height. So the translational kinetic energy is one half the total mass times initial speed squared and then plus this two here. This two is because there are two wheels to consider. Each wheel has rotational kinetic energy of one half times moment of inertia times angular velocity squared. 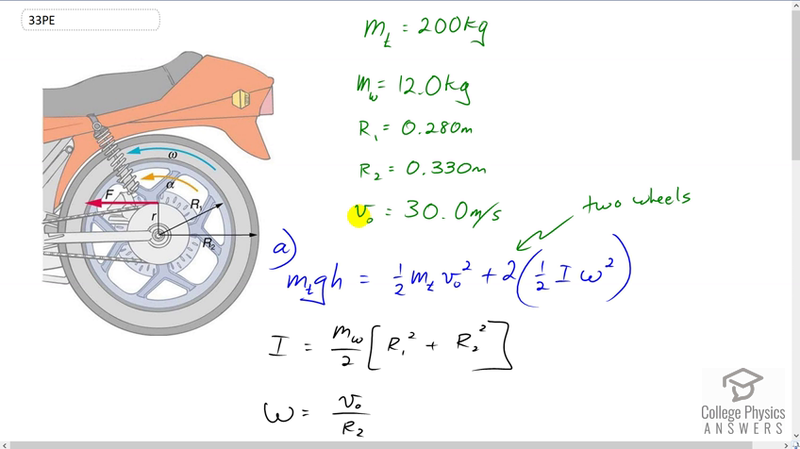 So the moment of inertia of this motorcycle wheel is -- we model it as an annular ring and so the mass of the wheel divided by two times its inner radius squared plus its outer radius squared is the moment of inertia. Its angular velocity we can write in terms of the translational velocity as v naught divide by v outer radius r two. So we'll substitute both of those things into our energy formula here. Then we solve for h by dividing both sides by total mass times g and I factored out the v naught squared over two and I wrote the g outside this bracket as well. That makes this factor turn into a one, that term I should say, turns into one. Then plus this term here, the one half is factored out so that's why it's not showing in the denominator anymore. There's this total mass factor there because we divided both terms by the total mass. Yeah, and there's an r two squared on the bottom there and this part is copied. Then we substitute in numbers to get the maximum height. So we have an initial speed of 30 meters per second, we square that, divide it by two times 9.81 meters per second squared, times one plus the wheel mass of 12 kilograms, times the inner radius of 0.28 meters, square that, and then plus the outer radius of 0.33 meters squared, divided by 200 kilograms total mass of the motorbike, times 0.33 meters squared outer radius. This gives 50.6 meters is the maximum height it will reach. Now if in fact it reaches only a height of 35 meters, how much energy was lost to friction? Well, that will be the difference between the potential energy we expected the motorbike to gain by reaching this height, minus the potential energy it actually gained based on the height of 35 meters. So the expected potential energy is total mass times g times h one and then the actual potential will be total mass times g times h two and we can factor out the m t g from both those terms. So we have total mass times g times the difference in heights. So that's 200 kilograms times 9.81 times 50.61 meters expected, minus 35 meters actual. This gives 3.06 times ten to the four joules of energy lost to friction.